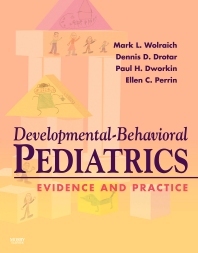 Based on the Diagnostic and Statistical Manual for Primary Care: Child and Adolescent Version (DSM-PC), this state-of-the-art reference expertly guides you through normal and abnormal development and behavior for all pediatric age groups. See how neurobiological, environmental, and human relationship factors all contribute to developmental and behavioral disorders and know how to best diagnose and treat each patient you see. Accurately identify developmental and behavioral problems using the Diagnostic and Statistical Manual for Primary Care criteria, and evidence-based guidelines. Gain a clear understanding of the "normal" boundaries and variations within specific disorders. Make informed therapeutic decisions with the integration of basic science and practical information and recommendations from the Society of Developmental and Behavioral Pediatrics and the American Academy of Pediatrics. Avoid legal and ethical implications by consulting the Law, Policy, and Ethics chapter. Download the DSM PC criteria from the included CD, as well as tables and illustrations for use in electronic presentations.